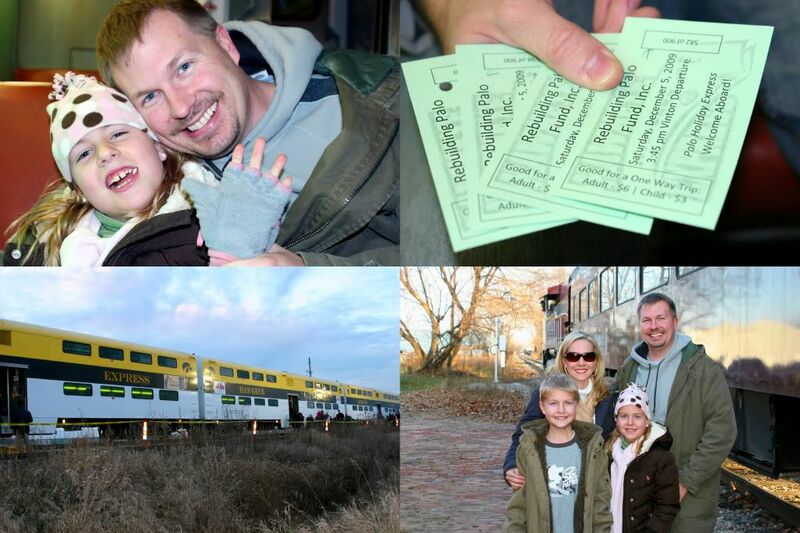 We decided to support Palo in their efforts to rebuild their city (due to the flooding last year) and purchased tickets for the Palo Holiday Express train. I was a little concerned when we arrived to board and there was a mile long line. Luckily by the time we parked most of the passengers were boarded and it turned out to be not too long of a wait. Good thing because even though the sun was out it was pretty chilly out there. Two days ago I pulled out my long down coat, but it doesn't seem to cut it for long durations in the outdoors unless I'm equipped with thermals, long socks, and mittens. I'm a wimp, I admit it. I've been trying to convince Haldan to move me to a warmer climate for something like 10 years now and I'm thinking I'm stuck in this frigid state they call Iowa. Even though I love the snow I could admire it from afar or make visits on the holidays or something. Anyhow, I've digressed. So, we left Palo and rode the train to Vinton. We got off and had 40 minutes in the cold to wait in a long line to get food, longer line to go inside the train museum, or even longer line to visit Santa. We opted for standing in the shorter line for a funnel cake while the kids played on the caboose. We decided we could visit Santa later at the mall and booked it for a nice, warm seat on the train with a better view for the ride back. It was a great plan, but we ended up sitting next to an obnoxious family and right away one of the kids threw a shoe at me. Not being in the most kind mood, I muttered something to Haldan about maybe not choosing our seats that wisely. The mom had like super hero hearing and responded to her husband that there was no "f---ing way she was going to ride the train back next to me". I was steamed and told Haldan we needed to move. He told me to go ahead, but that he and the kids were staying. I realized there were probably not better seats and decided to look out the window and do some deep breathing. I decided that if I ignored her she wouldn't bother me. The half hour back went ok. Even though the kid's constantly fought over feet space and picked at each other most of the way I think it was good that we had that time together as a family. Nothing like memorable family moments together. It won't be long before Haldan goes back to rotating shift work and our weekends will be daddy-less again. So, there ya have it... our attempt at finding some holiday cheer, as futile as it may have been. And maybe we've had our fill of the Palo Holiday Express train ride and will opt for something different next year. hopefully you had fun despite everything! so did you sit near the lady the whole way back? ?